After last week's post, I did indeed do what I came to the conclusion that I needed to do. I sat down and wrote it all out (with a cup of tea and a treat by my side). The final outcome was a schedule of schooling. Earlier this summer I had half jokingly printed up a sign and stuck it in my studio that reads: Atelier Manzanita. I decided that since I was bemoaning the loss of the structure and instruction that school provided, I would create that for myself. The instruction will be a bit challenging though. I am taking it in quarters or in about 8-10 week chunks with breaks in between. The weekly schedule at the moment is experimental. I have alternated days of color studies and cast drawing with figure drawing and days of working on composition and my own personal work. It will require a bit of self discipline. I think I will feel less frustrated on my own if I am at least working on skills and improvement with regularity and dedication and not just jabbing here and there. So, the new quarter of school at Atelier Manzanita starts Monday. I have been getting some of the tasks of daily living; yard work, preparing for the stormy season, cleaning, etc. done in preparation for being "back" at school. We have had wonderful fall weather so far with one incredibly perfect day last week. 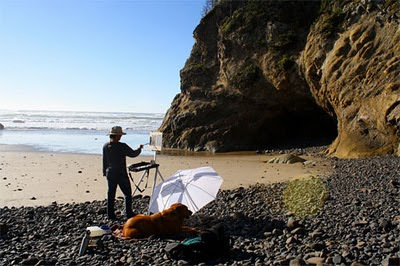 The tides and weather cooperated so I went plein air painting on Wednesday. It was sunny blue skies and warm, with no breeze, which is not usual. 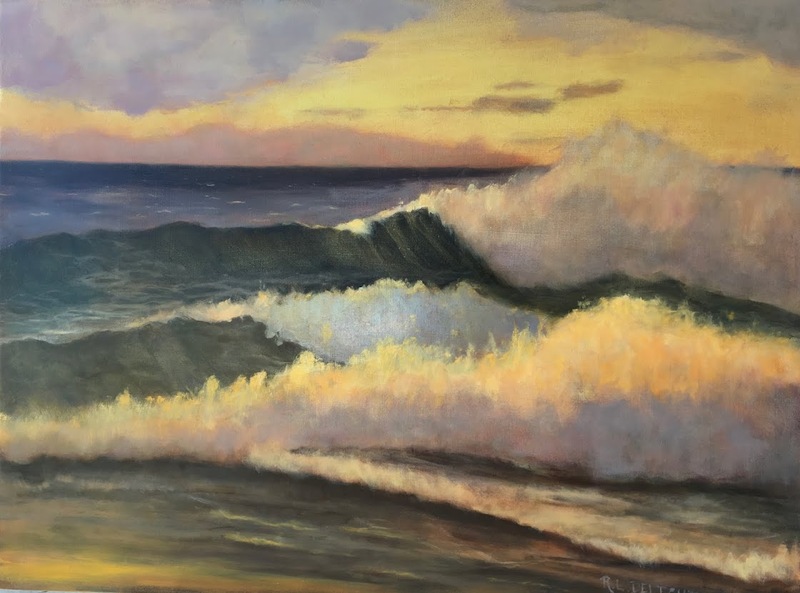 The tides were a bit higher than I realized so I wasn't able to get to the area I had wanted to paint until it was too late. I wanted that warm golden afternoon light on the rocks around the caves. 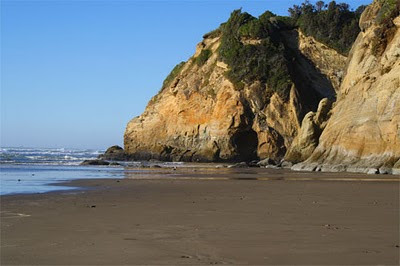 Here is Hug Point, one of my all-time favorite spots just a five minute drive up the road from us. Hug Point gets its name from this particular spot. The beach was the easiest path of travel down the coast in early years. "Easiest" is relative though! The native people had carved hand holds in the soft sandstone rock and, at low tide, you traversed around the point by "hugging" the rock and using the hand and foot holds. Note the darker stained rock at the bottom? That is from the sea and is how high the water gets. If only you could see the rocks just below the road and the cold water with its wicked tides and floating logs, you would understand even more what an act of courage that was. Later they blasted a crude road in the rock which is still there. It also hugs the point and is not available during high tide as it will be underwater. Many people, cars (think model T), and alas, horses, have been washed off the road in the past. There is a waterfall the spills onto the beach from the forest. It is a beautiful spot in a spectacularly beautiful area. I am hoping I will get another chance this fall to paint at Hug Point. This week though the forecast says we have several storms lined up with the jet stream pointed right at us. Good indoor painting weather! Next week, a report from my first week of school. like it will be fantastic to get you into concentrated learning. Good for you. I know it will be well worth the effort. Beautiful area and even better name. I wish you the best at getting "back" to school. It is easier to have the structure being in school provides. I wish you the best, keep yourself disciplined ( which can be the hard part). I am certain you will do great and your skills will keep increasing.